April 5, 2017, 10:37 PM · Sibling rivalry is the spice of life - at least it certainly spices up performances by Slovakian violin duo, Vladimir and Anton Jablokov. The brothers have been playing together since childhood, and their shows are a combination of joyous music-making and virtuoso playing, mixing popular melodies with clever takes on the classics. Lately they have been exploring their roots, performing and recording Russian folk tunes and romances, with a few pieces by Prokofiev, Rimsky-Korsakov and Shostakovich thrown in. Last summer, they were featured on both BBC 2 and BBC 4’s coverage of "Last Night Of The Proms 2016," appearing in Belfast with the Ulster Orchestra. 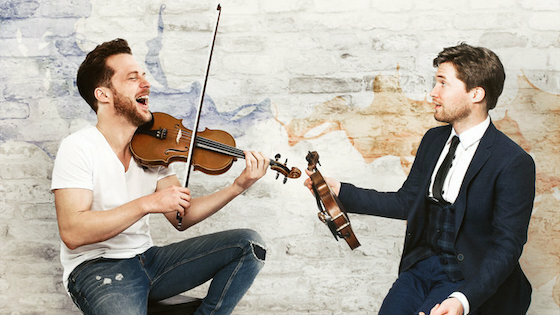 Their latest album, Vlad and Anton Live, was inspired by the adventures of their Grandfather Nikolaj, also a classical violinist, who was born in Moscow in 1925. Though they never met him, the ever-wandering violinist was legend in their home. "Our grandfather Nicolai was a professional classical violinist, and he traveled all over the former Soviet Union," Vladimir told me, speaking over the phone from Ireland, where they now both live. Grandfather Nicolai led a number of orchestras, but he didn't stop performing when the concerts were over. In fact, "whenever he had free time or he had finished a concert, he would just continue playing, but he would change his style quite dramatically." Nicolai would start playing the traditional, crowd-pleasing tunes. He would play any time, anywhere -- "at a train station or next to a bonfire, just to entertain people. He really enjoyed the violin, from all sorts of angles." Let's say these two apples have not fallen too far from that tree. Vladimir (left) and Anton Jablokov. Born in Bratislava to big family of musicians, the boys started early, imitating their violinist parents. "As a small boy I used to 'play violin' in the kitchen, with a chopping board for a violin, and a chopstick as a bow," Anton said. Both started more serious study around age six, as they knew they would - being somewhere in the middle among six siblings, "all my brothers played the violin, and my sister played piano." Youthful rebellion took hold of Vladimir in his late teens, when "I thought that classical music wouldn't be the coolest thing for me to do." Itching to do something different, he left Slovakia and went to Ireland, where he fairly quickly ran out of money. As a temporary measure, he picked up his violin and started busking - and that's when he fell in love with the violin again. "I quickly found my own way back, finding a different kind of music to play," he said. "Busking helped me in one big way: to see what people want to hear, what people recognize." Anton, who is four and a half years younger, went a different route: he completed his Masters degree at the Conservatorio della Svizzera Italiana in Lugano, and is currently working on a solo diploma. Yet Anton may have even more of his grandfather's gypsy spirit than Vlad: "Anton wouldn't mind playing for homeless person at 3 a.m. at the train station, if he asks," Vladimir said. "He'd take out his violin and play a couple of tunes, just to make somebody happy." This custom of Anton's began when people would see his violin and ask, "can you play something for me?" "Of course the answer is always, well I don't have my music on me, or I'm not warmed up, or you wouldn't like the piece or the style of music that I play because you wouldn't understand it, and so on," Vladimir said. Anton decided he wanted to learn a tune that people might recognize, a national tune. He chose "Those Were the Days." "Mary Hopkin made it famous in 1968 but we realized it is actually an old Russian tune from 1924," Vladimir said. "It was the tune of the Russian immigrants who had to leave Russia, and it became really popular in that time because it brought all the nostalgia back for good old Russia." The two did their own take on the tune; here is their live performance from last summer's BBC Proms. Vladimir discovered his younger brother's gift for entertainment -- and the power of Russian music -- when his string broke during a performance several years ago. Anton, who had been playing second violin, was left to entertain the crowd while Vlad changed his string. "I decided to play some Russian national tunes, just for fun. We played Cheburashka, from the Russian cartoon, and people really liked it." Actually, they loved it. "I came back to the hall, and the house was nearly standing," Vladimir said. "They were clapping so strongly that we thought, wow, it's interesting that Irish people would enjoy Russian music," Anton said. "That's how the idea came, that we could do a full CD with Russian music. After we decided to do it, we just picked all the Russian tunes that we like, and composed variations." How does that compositional process happen for them? "We sit down, with our pianist Adam and we just try out things," Anton said. "As soon as something is working, he writes it down to his computer. We compose by playing, by trying things, not without instruments. We are always trying it out." In a nutshell, they improvising together, based on those tunes, and then they like it, they write it down. "And sometimes we don't know if we will succeed," Anton said. For example, arranging Shostakovich's (Jazz Suite, Waltz No. 2), "We had doubts, whether it made sense to play such a piece," Anton said. "It's an orchestral piece that is already composed so well. But then we thought, we have to do something special to it, so we tried starting with the melody pizzicato, then I added whistling to it and all these things, to make it interesting, even without an orchestra sound." "Our sound is basically classical, but at the same time there is a lot of space for us to put our own ideas, like in the old days, when violinists used to write their own cadenzas for concertos," Vladimir said. "Heifetz was one of the last ones who did those, and after that it became all about perfection. Because of competition, people stopped being creative in classical music altogether." The brothers seek to make their music interesting for the audience, and interesting for themselves. Anything they play is subject to change and evolution; though they have a plan, they also try to keep it spontaneous. "That's the reason we wanted to do a live recording as well, just to capture the actual playing from the concert rather than going for perfection. Let's hear a few mistakes, but let's have the energy of a live performance." One thing I found interesting about their show was Anton's pizzicato -- he uses up to four fingers, producing a tremolo that sounds like a mandolin - or perhaps a balalaika. They continue to explore new "tricks' on their fiddles, to liven things up. Last question: Does this seemingly harmonious pair really have a case of sibling rivalry? "We fight, actually, all the time, but not seriously," Anton said. "After a few minutes we are all right and we can continue working." In some ways, it's easier than working with strangers, he said. "If you are a musician and someone else says you are out of tune, you might get angry and go away. If I tell Vladimir, you play terribly, okay -- and he tells me the same. And we don't get offended. Vladimir said that their arguments do occasionally get heated enough that "very often other musicians will be taking video of us when we argue. It never stops the rehearsal, but sometimes the argument goes on for three or four minutes." One person who is not arguing is their grandmother, who is still alive and remembers well the tunes that her husband once played. When she heard what music they were playing, their grandmother traveled from Moscow to see them perform live at the National Concert Hall in Ireland. "She was crying from happiness when she heard all this Russian repertoire, she still remembers." Here is a link to their album, Vlad and Anton Live and on iTunes.